Social Tap is no stranger to creating delicious food, including weekend brunch. If you have a sweet tooth, start your day with the Baked French Toast ($10), soaked in vanilla and cinnamon, then topped with house made blueberry compote and fresh whipped cream. Social Tap Eatery is located at 4312 N Brown Ave, Scottsdale and can be reached at (602) 432-6719. They are open for weekend brunch on Saturdays and Sundays starting at 9 a.m. In The Lodge fashion, the restaurant and bar offers two versions of “Man V. Food” type of French toasts on the weekend brunch menu. Brunch enthusiasts can order the decadent Lumberjack French Toast made with candied walnuts, whipped cream, sautéed bananas, and vanilla bean ice cream ($8.50) or a classic rendition of French Toast, a Texas toast coated in special cinnamon batter with powdered sugar and maple syrup ($7). The Lodge Sasquatch Kitchen is located at 26. S. Farmer Ave., Tempe and can be reached at (480) 967-0578. 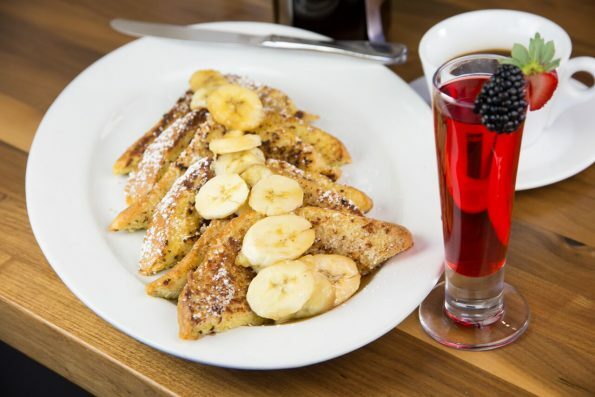 The Hash Kitchen is known for their creative spin on classic breakfast dishes, especially French toast. The Banana Split Brioche French Toast ($13) with caramelized bananas, sweet mascarpone, seasonal berries, and warm salted caramel drizzle and the Coconut & Almond Encrusted French Toast ($13) with caramelized bananas and a hot maple reduction are just two of the amazingly-sweet dishes Chef Joey Maggiore makes. The Hash Kitchen is located at the Shops at Gainey Village at 8777 North Scottsdale Road, Scottsdale and the second location is at 14838 North Frank Lloyd Wright Boulevard, Scottsdale.